Coverage is one of the biggest factors you will need to consider when it comes to finding the best wireless dog fence for your dog. Coverage is the area, or space, that you designate as a safe space for your dog to be in. And while your number one priority is to make sure the area is safe, you also want to make sure it is spacious enough for your dog to run around in and have a good time. What we have discovered is that two acres of coverage is ideal for just about all dog sizes. It gives you plenty of room to train your dog, and it gives your dog plenty of room to enjoy himself. Because we understand just how difficult it can be to find the perfect wireless dog fence, we took it upon ourselves to research and review the top 5. But before we dive in let’s first talk about 3 very important things you should consider when looking for a wireless dog fence with 2 acre coverage. The first thing you want to consider is portability. Not only are portable systems easy to set up, but they are also easy to take pack up and take with you on a vacation. The boundary zones are usually circular and the shape cannot be changed. They can however be adjusted to fit the size of the property. Portable systems can be affected by metal objects and uneven yards. Do you have multiple dogs? If so you will need a system that can support all of your dogs. The good news is most systems are now setup to handle multiple collars. Some systems can even handle an unlimited number of collars. However, you will need to purchase additional collars in order for the system to support multiple dogs. While most people consider the size of the coverage area, very few actually consider the shape. Portable wireless dog fences will almost always have a circular boundary. And while the size of the boundary can be adjusted, the shape cannot. You are also not able to exclude certain areas such as a garden bed or pool area. This can prove to be a huge problem for those who need to keep their pets out of certain areas. In this case your best option would be a customized in group system. Customized in ground systems give you more flexibility and allow you to cover larger areas. They also allow you to zone off certain areas if necessary. The two big disadvantages of using customized in ground systems is that they are very expensive and can be difficult to install. You will need to bury wire in order for the system to work. And if you ever want to adjust the boundaries you will first need to dig up the wires. That is why we always recommend wireless dog fences. Not only do they not require any digging to bury wires, but they are also super easy to set up. Most systems can be up and running within 2 hours. Here are the 5 best wireless dog fences with 2 acres of coverage. Based on our research the Petsafe Free to Roam is at the top of the list when it comes to wireless dog fences with 2 acre coverage. The wireless boundary keeps your pet safe while also giving them the freedom to roam around. And the best part is you get to protect, teach and love your pet for 15 times less than a traditional fence. The wireless circular boundary can cover up to ½ an acre. The boundary is also adjustable and can go from 5 feet all the way up to 90 feet in all directions from the indoor transmitter. The transmitter can be plugged into any standard outlet. For best results set it up as close to the containment area as possible. If you need to create a larger play area you can use 3 PetSafe wireless transmitters at the same time. Once set up the transmitter will send a static correction to the receiver collar anytime your dog crosses the boundary zone. The receiver collar has 5 levels of correction so you can adjust it to suit your dog’s temperament. There is also a tone only mode for training purposes. The receiver collar is waterproof and has a battery life of up to 3 months depending on how you use it. The kit comes with 50 boundary flags so you can set up visual markers during training. Completely wireless. Requires no digging. Adjustable wireless boundary. Can cover up to ½ acre. 5 levels of static correction so you can customize it to your pets temperament. Tone only mode for training. Quick and easy setup. Most pet owners have it set up in 2 hours or less. Portable. Can easily be taken on vacations. Comes with manufacturers warranty. Please note the warranty is only valid if you purchase the unit from an authorized retailer. The transmitter can only be placed indoors. This can prove to be a problem for some dog owners. Some users have complained about the collar being cheaply made. Connection can be inconsistent if you live in an area with hills or a lot trees. Users have complained about the durability of the product. With the Petsafe Stay & Play you will literally be able to set up a dog park in your own yard. In order for the system to work you will first need to set up the boundary zone. The boundary zone is a circular area that will contain your pet. It can go from 22 feet all the way up to 105 feet in all directions. The boundary can easily be adjusted by turning a dial. The transmitter should be positioned as closely as possible to the pet’s play area. Please note it must be plugged into an indoor electrical outlet to work properly. Once you have the transmitter setup you can start the training process. To make it easier the kit comes with boundary flags that can be used as visual aids during training. The transmitter will send a constant signal to the pet area to ensure your dog doesn’t go outside the boundary. Anytime your pet gets too close to the boundary zone a warning tone will be sent to the collar. If your pet doesn’t stop and continues moving closer to the boundary the system will send a safe static correction to the collar. This is simply to remind your pet to return to the safe area. The collar offers five levels of static correction so you can customize it to your dogs temperament. There is also a tone only option. All it usually takes is a few short training sessions for your dog to understand the new boundaries. Once the dog understands the new boundaries he, or she, will have more freedom to run around and have a good time. One thing to keep in mind is that the boundary is circular and cannot be changed into a different shape. You should also note that the range can be affected by things such as metal objects, trees, terrain, and topography. The great thing about the Petsafe Stay & Play is that it is portable. Once your pet has learned the system you can then take it with you during travel. No matter where you are, your pet should recognize the warning tone and not go past the boundary when he hears it. As long as you have an outlet you can plug it up and keep your pet safe. Easy setup. 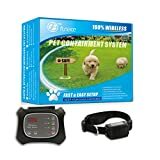 Most pet owners have it up and running within 2 hours. Wireless boundary. Requires no digging or burying wires. Covers up to ¾ acre. Boundary can be adjusted up to 105 feet in all directions from the indoor transmitter. Can monitor an unlimited number of pets with the purchase of additional receivers. Offers 5 levels of static correction. Plus a tone only mode. Collar is rechargeable and ergonomic for comfort. Rechargeable collar can last up to 3 weeks depending on how often you use it. Collar can be fully charged within 3 hours. Comes with manufacturers warranty. Note warranty is only valid when product is purchased from an authorized retailer. Boundary can be unreliable if you live in an area surrounded by hills and trees. Metal can also interfere with the connection. Some users have mentioned the product stopped working after only a few months. The boundary is a circle and cannot be changed. Inconsistent signal can cause random shock. 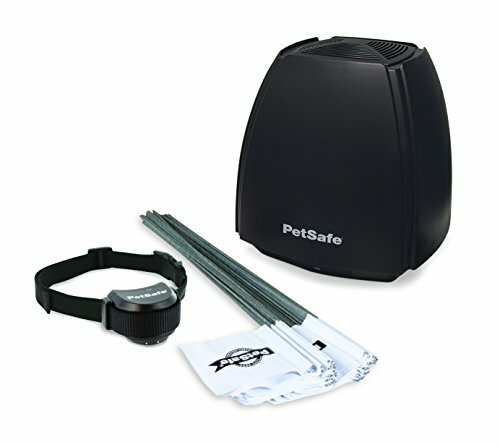 The Petsafe 2 Dog Stay & Play wireless dog fence is designed with safety and convenience in mind. It will provide your pet with the freedom of movement without the need for digging trenches and burying wires. The wireless transmitter is small enough to fit in just about any location in your home. It is also portable which makes it great for travel. Once you set up the transmitter it will emit a wireless signal that covers up to ¾ of an acre. If you want a larger containment area you will need to invest in multiple transmitters. 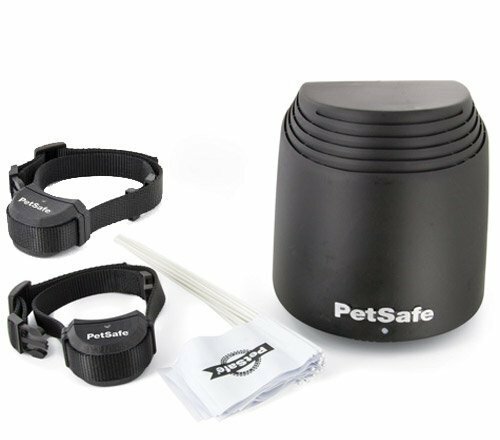 A key feature of the Petsafe 2 Dog Stay & Play wireless dog fence is portability. It is the perfect system for those who love to travel. The collar that comes with this unit is rechargeable and waterproof. It is also contoured to ensure it fits comfortably on your dog. The collar features 5 levels of static correction as well as a tone only mode for training purposes. Rechargeable receiver collar that can be fully charged in 3 hours or less. Collar is ergonomically designed to ensure comfort. Collar has 5 levels of static correction. Collar has tone only mode for training. Collar has been reported to shock dog even when dog is within the boundary zone. The signal can be inconsistent at times. Expensive. The unit costs over $400. Many users have complained about how difficult it is to set-up. The NeoPaw Dog No Bark Training Collar with Remote Wireless Dog Fence Containment System is perfect for eliminating unwanted behaviors such as barking, digging, jumping and bolting into the street. The remote controlled range is about 330 yards. And with 100 levels of stimulation you are sure to find one that’s perfect for your pet. There is also a separate mode button for beep, vibration, and shock. This ensures you don’t choose the wrong correction mode when trying to correct your pet. And don’t worry, the correction is never so strong that it will hurt your dog. It will be just strong enough to capture their attention and encourage them to return to the containment area. The adjustable collar can be adjusted from 5 inches all the way up to 23 inches. It can fit dog breeds that weigh between 15Ibs-100Ibs. This makes it perfect for puppies, small dogs, medium dogs, and larger dogs. The receiver is removable and can be installed on different collars depending on its preferences. The receiver has an IP67 waterproof standard. Under certain conditions it can be immersed in water and not be affected. Please note the remote control is not waterproof. The NeoPaw Dog No Bark Training Collar with Remote Wireless Dog Fence Containment System can be used for up to 7 days on one full charge. The length of time the charge will last depends how often the device is used. Additionally, both the receiver and remote can be charged at the same time. To help conserve power there is an automatic standby and memory function. 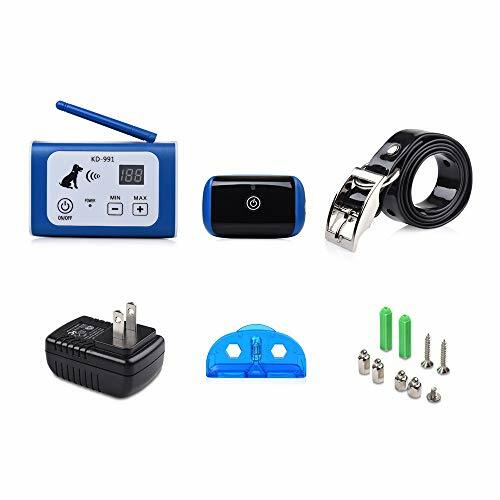 The transmitter can control up two dogs if you invest in additional receiver collars. Up to 100 levels of vibration and shock mode. Separate mode buttons ensuring you don’t choose the wrong mode. Up to 330 yards of remote controlled range. Adjustable collar. Can go from 15 inches up to 23 inches. Receiver has an IP67 waterproof design. Device can last up to 7 days on one charge depending on how you use it. Some users have complained about the remote being too small to comfortably hold. The receiver collar can easily slide off making it completely useless. The Funace Wireless Pet Fence is a practical containment system that gives your pet the freedom to roam around. The collar is cordless, rechargeable, and can last up to 3 days on a full charge. 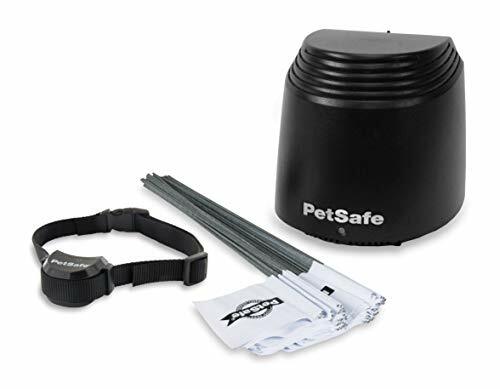 The Funace Wireless Pet Fence is designed in a way that allows for additional transmitters to be set up in the home where the dead spots tend to be. This helps ensure you get a 100% signal coverage. You can also expand signal coverage to your basement or upper level of the home by adding an extra transmitter. The unit has a large coverage area of up to 500 feet in radius. This gives your dog a 17 acre perimeter to run around in and have a good time. If you need more coverage you can expand it by adding additional transmitters. Please note if you have a large estate there is a 50 feet house to boundary minimum requirement. The receiver collar is water resistant and has a IP65 rating. This means your dog is free to roll around in the wet grass, run through the sprinklers, or play in the rain. The unit can support an unlimited number of collars which makes it easy for you to safely contain multiple dogs. The Funace Wireless Pet Fence works on all size dogs from small to extra large. 100% wireless. Requires no digging trenches or burying wires. Rechargeable collar. Can be fully charged in as little as 2 hours and can last up to 3 days. Features anti-shocking design to ensure pets will not be over shocked. Can support up to 17 acres per transmitter. This means you could have unlimited coverage if you invest in multiple transmitters. Comes with an unconditional 100% 30-days no risk, no-nonsense money back guarantee and a 90-days manufacturer warranty. Collar receiver is water resistant and has a IP65 rating. Has the potential to randomly shock your pet. Wireless dog fences are great for pet owners who need a quick and easy way to curb unwanted behaviors such as jumping on people or darting out into the street. Instead of having to constantly verbally correct your dog, you can use a wireless fence system to train him on what behaviors are acceptable and which ones are not. The good news is most dogs start to understand their new boundaries fairly quickly. This means both you and your dog will have more time to enjoy each other and nature. Check our General List of Best Wireless Dog Fences.